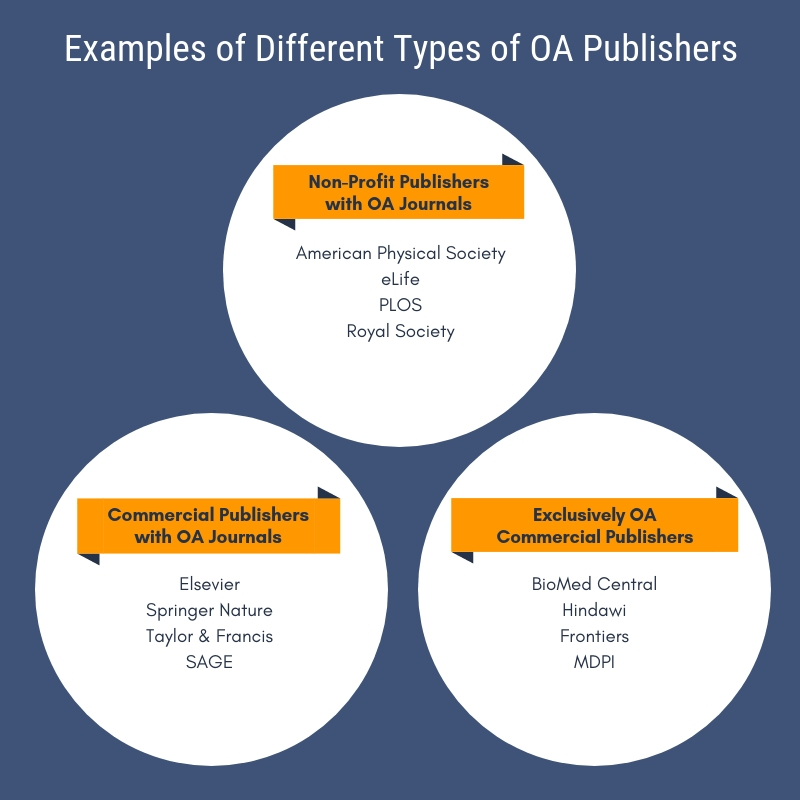 “Types of OA Publishers” by Annie Johnson is licensed under CC BY 4.0. This week is Open Access Week, a yearly international celebration that aims to increase awareness about open access (scholarship that is free to read and reuse). Most academic work is locked up behind a paywall, available only to those who are affiliated with a college or university. One way researchers can make their work more widely available to readers is by publishing in an open access journal. Some of the largest publishers of open access journals are actually commercial publishers you’ve probably heard of, like Elsevier and Springer Nature. SAGE, De Gruyter, Taylor & Francis, and Wiley also publish open access journals. eLife is a non-profit OA publisher/journal that was founded by Howard Hughes Medical Institute, the Max Planck Society and the Wellcome Trust is 2011. They publish scholarship in the life and biomedical sciences. Some articles published in eLife include ancillary materials, such as the decision letter from the editorial team with suggestions for improvement, as well as the authors’ response to that letter. Peer reviewers may also choose to reveal their identities to authors. In addition to traditional journal content eLife runs a magazine which includes editorials, interviews, and podcasts. eLife is one of the most prominent publishers to criticize the journal impact factor. As a result, they do not report on or promote this metric. Founded in 2001, PLOS (Public Library of Science) is a non-profit publisher that publishes seven journals. Its flagship journal, PLOS ONE is known as a “mega journal” because of the large number of articles it publishes (22,054 papers in 2016 alone). In 2014 PLOS implemented a new data policy, in which they require that all researchers make the data underlying their work fully available. Based in the United Kingdom, BioMed Central (BMC) was founded in 1999 and publishes over 300 journals. It is now owned by Springer Nature. Temple University Libraries is an institutional member of BMC, and automatically covers 50% of the total APC for all Temple researchers who submit. F1000 Research is a scholarly publication platform that was founded in 2000. It is known for its use of open peer review. F1000 Research publishes posters and slides in addition to scholarly articles. Frontiers Media was founded in 2007 and is based in Switzerland. It currently publishes sixty-three open access journals in a range of disciplines. Hindawi is an open access publisher based in London. It was founded in 1997, although it did not become an exclusive open access publisher until the 2000s. Hindawi currently publishes over 400 journals. Founded in 1996, the publisher MDPI (Multidisciplinary Digital Publishing Institute) is based in Switzerland and publishes 203 open access journals, mostly in the sciences. Launched in 2013, PeerJ is a publisher of two journals: PeerJ (which focuses on the biological, medical and environmental sciences) and PeerJ Computer Science. They also have a repository for preprints, called PeerJ Preprints. In the beginning, PeerJ relied on a membership model to make money, in which authors would pay one fee and they could publish for free in PeerJ for the rest of their careers. They have recently changed their model so that authors can pay an article processing charge (APC) instead of purchasing a lifetime membership. One last note: all the publishers profiled here are members of the Committee on Publication Ethics, and their journals can be found in the Directory of Open Access Journals. No matter what discipline you are in, it is hard to ignore the major shift from traditional journal publishing to open access publishing. In honor of Open Access Week 2017, we are celebrating faculty at Temple University who support open scholarship in a variety of ways. 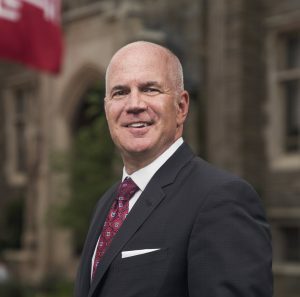 One of these faculty members is David Sarwer, the Associate Dean for Research, and Director of the Center for Obesity Research and Education at the College of Public Health. Sarwer is also the Editor-in-Chief of an open access journal, Obesity Science & Practice. He sat down with Biomedical & Research Services Librarian (Ginsburg Health Sciences Library) Stephanie Roth to discuss his experiences as the editor of a new open access journal. Please tell us more about Obesity Science & Practice. How did you become involved as the Editor-in-Chief? Obesity Science & Practice is a Wiley journal. They publish four other journals in the area of obesity and were quick to recognize that there was an increasing number of high quality papers not making the cut in those journals. When they approached me about serving as the inaugural Editor-in-Chief, I was still skeptical about publishing in open access journals. The more the Wiley team taught me about their approach, I came to believe that open access publishing was likely to play a significant role in the future of academic publishing. What gave you confidence to believe in open access? The early success of the journal has given all of us a great deal of confidence. We have quickly moved to publishing four issues a year. We now receive a steady stream of articles that are either direct submissions to the journal or are referred to us by other Wiley obesity journals. Many of the papers published in the journal have come from internationally recognized authorities in the field of obesity. All of these developments give me a great deal of confidence about the future of the journal and open access publishing more generally. When you first heard about open access publishing what were your immediate thoughts? Like everyone else, I was familiar with the old school publishing model. So, I was hesitant and skeptical. The Wiley team did a great job to make me comfortable that open access represented the path to the future. Did you ever publish to an open access journal prior to becoming the editor of one? No, but I wouldn’t hesitate to publish in a high quality, reputable open access journal today. Now as an editor, what are your thoughts about open access publishing? I am very impressed with open access compared to traditional publishing and especially by our journal. The speed at which we are able to process papers and push them out to our readers is a great strength. We have published a number of high quality, impactful papers in the field. Several of them have received mass media coverage as well, which is an important, yet often overlooked aspect of academic productivity. What has been your experience with OA journals vs. traditional publishing? I haven’t noticed much of a difference. Many non open access journals are now putting their papers online. That shows the potential growth and acceptability of open access in the future. What has contributed to more authors embracing your journal? It has helped that Wiley is well recognized for their journals. That has helped to increase our journal’s credibility. Wiley has also done a good job identifying high quality submissions that were rejected from one of their four other major obesity journals. When a paper is referred to us from one of those journals, we often use the previous reviews to inform the editorial process and decision making. This has allowed us to move papers through the review process quickly. What are your future plans for the journal? I would like to stay on our current path of success. We recently moved to publishing four issues a year and continue to receive a steady stream of papers. I would like to see the first impact factor be appropriately robust and to have it grow over time. Do you provide tools for graduate students or residents to publish in your journal? At the journal level, we aren’t doing anything specific for graduate students. We do receive a fair amount of submissions from those who may be working on their first papers and launching their own independent careers and that is also encouraging. What tips would you give to researchers looking to publish in an OA journal? I would like to encourage them to make sure they don’t discount them. Be thoughtful. Make sure the journal is a legitimate outlet, and not one associated with predatory publishing. Researchers should see open access as an important and central part of academic publishing in the future.